Third graders in Alamogorodo, New Mexico, learning about desalination at the Brackish Groundwater National Desalination Research Facility.To support learning and education in the Alamogordo, New Mexico, area the Bureau of Reclamation's Brackish Groundwater National Desalination Research Facility hosted 545 students at the Fourth Annual Discovering Desal event. 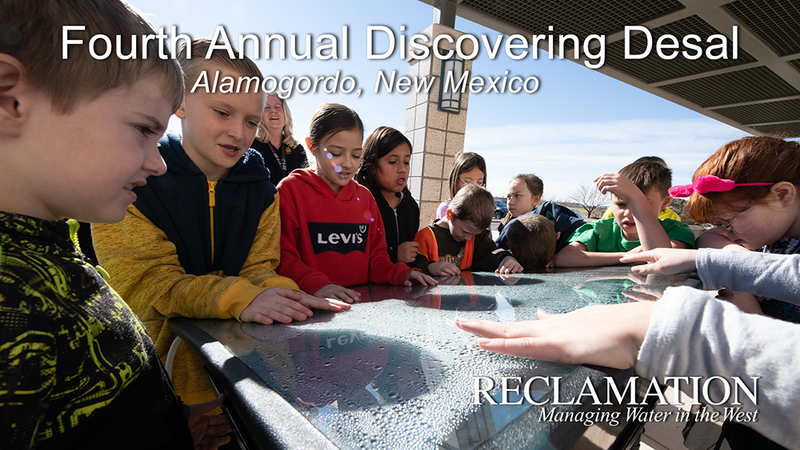 The students visited the facility from March 4-12 and came from the Alamogordo Public School System, two private schools and a local homeschooling group. Students rotated through seven learning stations to discover how to make fresh water from salty water. The students, teachers and parents had a fun and positive day. The BGNDRF sits on 43-acres in Alamogordo. The research facility brings together researchers from federal government agencies, universities, the private sector, research organizations, and state and local agencies to work collaboratively and in partnership on cost-effective advancements of desalination technologies. To learn more about the facility or the event, please visit its webpage at https://www.usbr.gov/research/bgndrf/.